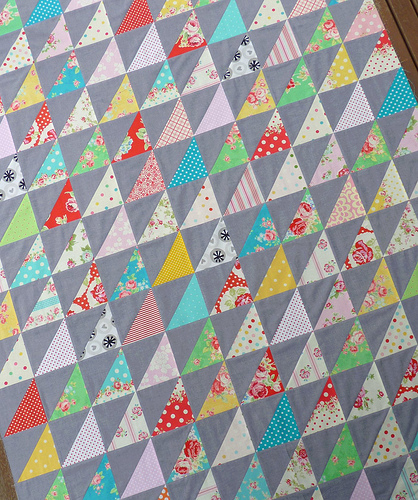 I love the contrast of the bright fabrics and the grey solid! Wonderful contrast. Just beautiful, Rita. Great job! I feel I need to make this. You've given me a new-found appreciation for that humble color gray. this is divine Rita - a piece of tranquil beauty in amongst our current chaos! This turned out great! I'm inspired to go sew some HST's. 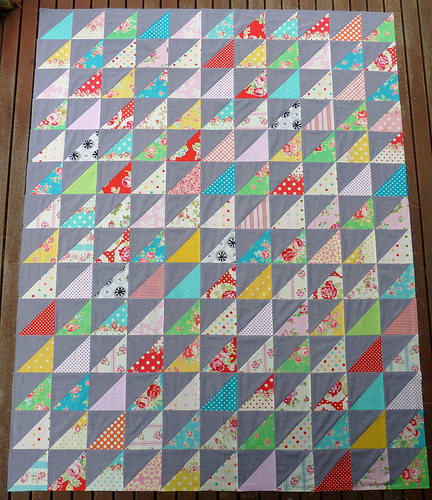 There is only one word for thsi quilt......YUM!!!! Love it! Your quilt is beautiful. I love gray and have been trying to decide what pattern to use. Now that I've seen this one with 1/2 square triangles I really love it. it's beautiful. i love flower sugar and i love tanya whelan's designs (don't have delilah yet)--you're a genius to see that they go together perfectly--thank you! All I can say is..... LOVE IT, LOVE IT, LOVE IT!!!!! Never have HST looked so grand! The grey is a great choice, I'm not sure I would have even considered it. I probably would have stuck with boring old white. I never get tired of this layout. So simple and beautiful. Rita you are always so adventurous with using solid colors. I definitely need to experiment more! Great quilt!